A few weeks ago, I went on a bit of a nut buying binge. I'm not sure what prompted it, but at the height of craziness I looked around and realized I had pounds and pounds of nuts in my kitchen. I was like a squirrel saving up for winter. I've slowly worked my way through most of them, except for a lonely bag of raw cashews that was just sitting in my refrigerator door. At first I was going to make a cashew cheese dip with it (it's something I make regularly for the vegan yoga groups I cook for up in Vermont), but then realized that I also have a fridge full of real cheese, so what the hell would be the point of making fake cheese? So a little non-vegan baking was clearly the way to go. I decided to make a nut meal by grinding the cashews up in the food processor, then using them the way I'd typically use almond meal. 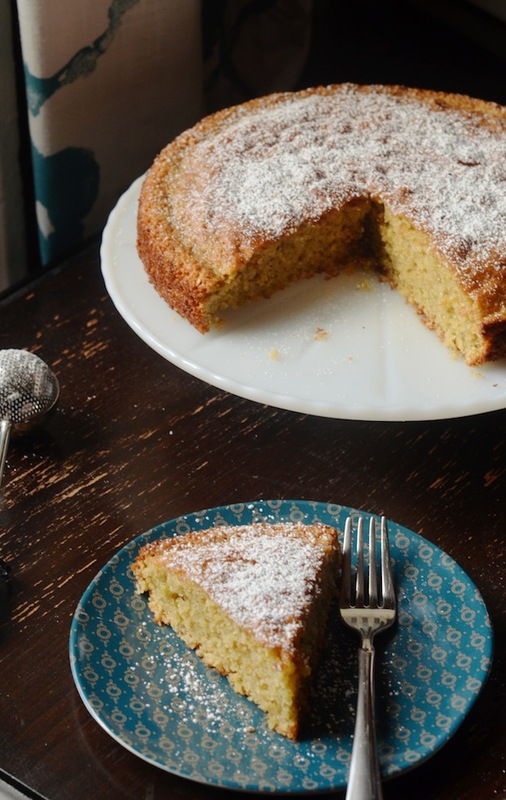 Combined with a bit of ground gluten-free oats, they made a beautiful base for this cake. I love how the cake has a bit of a crunchy crust while staying moist and slightly crumbly on the inside. Olive oil instead of butter. Crunchy turbinado sugar. 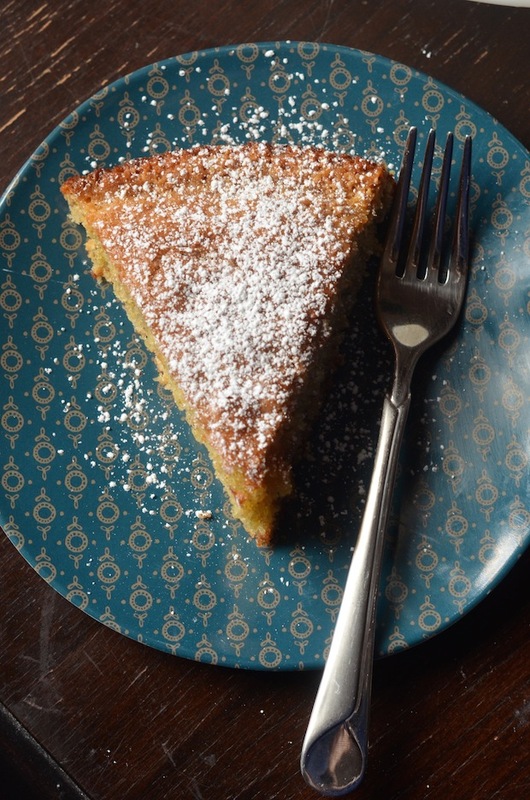 A real vanilla bean scraped in and flecked throughout the batter. Seriously. So much good stuff going on here. And if you eat paleo, you can easily adapt this by subbing in coconut palm sugar and quinoa for the oats. Now everybody can enjoy! The final cake is a perfect tea time cake. Or The Mindy Project is about to start in, like, two minutes and I need something sweet time cake. A little sprinkle of powdered sugar on top using my super cool new powdered sugar wand which you can kind of see in the top left of the above photo (Say what? Seriously! ), and this lovely one-bowl baby was good to go. Preheat your oven to 350 degrees. Grease a 9" round spring-form pan and layer the bottom with a round of parchment paper. In a large bowl, whisk together the cashews, oats, sugar, baking powder, and salt. Add the beaten eggs, olive oil, vanilla bean seeds, and extract(s), and beat well to combine. Let cool in pan 10 minutes, then use a knife to loosen from the sides and remove. Transfer to a rack to cool completely. 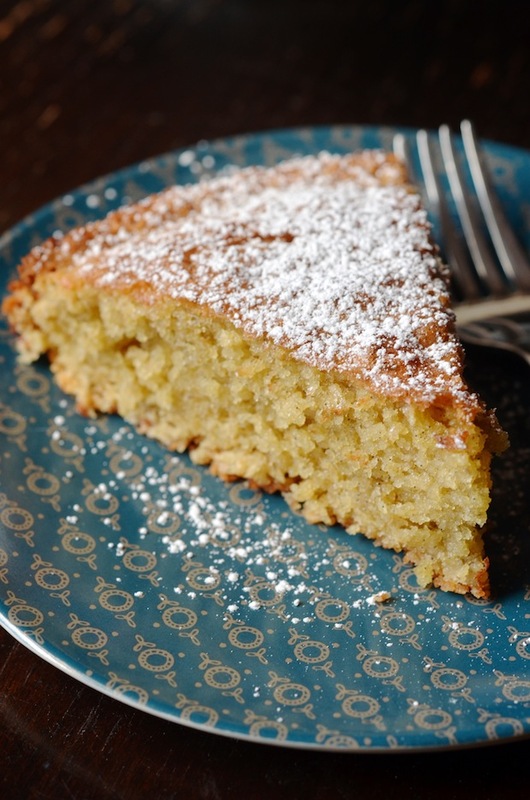 Serve dusted with confectioner's sugar.